Mahogany ornament display shelf. Condition is Used. Sold as seen. Will have light clean and polish on collection. Please see other listings for similar items. 5 Tier Corner Shelf Rack Floating Wall Shelves Storage Display Brown - Mahogany. 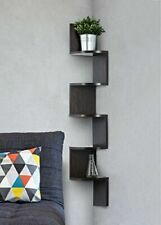 Saganizer corner shelf brown corner shelf unit 5 Tier corner shelves by Saganizer - Corner wall shelf Simple stylish design yet functional and suitable for any room. Antique / Victorian Mahogany Glazed Cabinet Or Bookcase With Height Adjustable Stained Pine Shelves, Using A Nice Peg And Groove System Displayed In The Images ​Solid Thick Oak Cabinet With Nice Quality Mahogany Veneer This Would Of Originally Been The Top Section Of A Dresser Or Sideboard, But Working Well As Its Own Piece ​With A Some Minor Age Related Wear To The Veneer Around The Edges Which Really Is Not An Issue, Remaining Strong And Solid/Ready For Use. With An Authentically Aged Rustic Look. The Original Top Is An Oak Plank, Again Rustic. ​This Would Also Make A Nice Piece For The Kitchen Or Even The Bathroom For Storing Towels And Toiletries. ​The Inside Of The Left Door Has A Brass Latch, The Other Has Lock But With No Key. ​Dimensions: height 104cm x width 96cm x depth 26cm ​. Possibly hand made and looks like Mahogany and Oak. Solid Hardwood Corner Shelf Unit. Lovely solid hardwood corner shelf unit. Solid hardwood planked back. Lovely moulded top fascia, shaped shelves and turned finials to base. Three Shelf Mahogany Bookcase/Display case. As photos in solid mahogany. Collect from Hinckley LE10. Mahogany whatnot 4 tier display unit, in good used condition. Nice compact three shelf Bookcase in Mahogany. Price is for Bookcase only. Useful drawer at the bottom. Solid Mahogany book or display shelf..elaborately carved and finished. This book shelf is made of solid mahogany from sustained forests and duly approved by the Rainforest Alliance. It is an attractive and useful piece of furniture. Depth is 19.5 cms. Length is 42.5 cms. Lovely stand with three tiers. A reproduction I believe. A couple of scratches - see close up images for details. Collection only from LS27. Quality Inlaid Curved Mahogany Book Case with 3 Adjustable Shelves & Three Drawers, one large 2 small. The large drawer is in the centre and a small drawer either side. They all have brass handles. Three Shelves are adjustable. Top shelf 45" length, 9" depth. Bottom shelf 40" length, 8" depth. Any problems?. EBAY'S FINEST SHELVES SEE OUR FANTASTIC FEEDBACK!!!! It has 6 adjustable shelves, I've only used it with 5 over the years and have a spare one, but to use it a couple of wood batton holders would need to be fashioned. As you can see the shelf height is set by little wooden battons that slot into mahogany holders. Condition Sound structure. Top of dresser. Wear to finish as pictured. Wood Mahogany. Depth 16 cm 6 1/4 in. Height 106 cm 41 3/4 in. I reasonable condition these rolling shelves are good solid wood that would benefit from a paint or restain. They will take a lot of weight and with some tidying up wollild look great in a house including in the kitchen or would make good garden or garage storage. Being on casters make them easy to move and could be used as an island kitchen unit. Please note I live up 12 outside steps so you will need to be able to carry them down. I can assist with this if you need help but it would probably be a 2 person job.